Last October, Facebook quietly launched Instant Articles for iPhone, “a beautiful new way to read articles in the News Feed that is faster and more interactive than ever before,” according to the company. This product is aimed at being a game-changer for the publishing industry by offering a solution to what Facebook and publishers identified as a problem of slow loading times and whether publishers could bring their own advertising to the table or would have to use Facebook’s ad network. Brands today know and benefit from the power of social media. On Facebook alone, the user base has expanded to 1.04 billion daily active users and 934 million mobile daily active users as of December 2015, allowing companies to connect with their audience at scale. And with 63% of Facebook users getting their news through their social networks, according to Pew Research Center, content marketers everywhere are looking into how they can participate in the new Instant Articles feature. This begs the question, “Is it even open to us?” And that can be a complex answer depending on where you look. Officially, on the Instant Articles site, Facebook discloses that this product will open for all publishers. But how are they defining publishers? A magazine, journal or newspaper? That wouldn’t be great news for brands. What about as anyone who creates and publishes content? Now that would be awesome. This makes it sound like a yes—brands will indeed be able to publish Instant Articles, with the disclaimer that there may be more suitable formats available. So how do you determine if this is right for you? Facebook Instant Articles presents a new opportunity to deliver content—whether you’re a publisher or brand—especially via mobile (a channel that has experienced almost nonstop growth since its inception). Because people face such an onslaught of messages—from their inbox, to social media, to offline communications—content that captures the interest of your audience and offers true value is now, arguably, the only way to capture their attention on any channel. 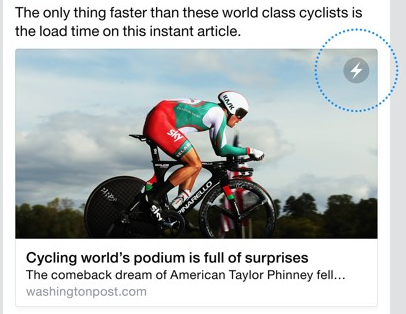 Content marketing is now a familiar marketing activity that most marketers practice, and Instant Articles offers an immediate way to deliver content to an interested audience with faster load times—reportedly as much as 10 times faster than the standard mobile web—and without the need to navigate to a new channel. As a content marketer, the idea of a new platform for you to deliver your content to an interested audience can be both exhilarating and terrifying. There are so many places and platforms to disseminate your content today, but the promise of hosting your content on a platform that gets about one billion visitors a day is enticing, to say the least. But it’s OK to feel wary of an unknown platform and process, especially if you’ve developed a seamless way to publish and measure the impact of your content on other channels and programs. I’d encourage you to not let that stop you, as Facebook’s Instant Articles allows you to customize the typeface, color, and layout of your content to keep it on brand and use your existing analytics platforms to measure its success. It even allows you to serve ads on your content, opening up a new advertisement channel. So if you have your content measurement down already—from early stage metrics like downloads and shares to late stage metrics like first-touch and multi-touch pipeline and ROI—you may still be able to apply these practices to the new platform to understand its impact, not to mention to optimize your results. The Instant Article product itself is defined by its ability to instantly load with rich images, interactive content, and auto-play video. Today, this content is demarcated to users by a small lightening bolt icon in the corner of the article. There is definitely an advantage to being an early adopter of these products. Often, you gain more attention from your audience because the functionality is new and novel, and that’s worth something. Additionally, you usually have an opportunity to deliver feedback and learn with the product. But this can all come down to a matter of comfort and resources. Do you have the bandwidth to learn (probably a pretty intuitive) new platform and then add that step to your content publishing process? The second challenge of adapting your content to the platform is one that may affect lean or small teams the most. It will be interesting to see if brands, that have other objectives for their content (like demand generation), will have to adjust their content strategies to incorporate Instant Articles as a “new” type of content or if it will simply be an extension of what they are already doing and have planned to in their editorial calendar. Because this product is centered around delivering a high-quality experience to the user—with fast load times and interactive visuals—its success may force content marketers to redirect some of their attention toward tailoring content and interactive experiences for this platform, where they didn’t have to before. Finally, Digiday recently reported that Facebook is allowing some publishers test newsletter sign-up messages with their Instant Articles—trial publishers include The New York Times and The Washington Post. This is an interesting move for publishers whose biggest caveats when it came to publishing on a separate platform were ad revenue and audience ownership. With the possibility of reaching your audience on email through newsletter sign-ups, Facebook may solve both. For brands and the marketers alike, this could make a huge impact. If and when Facebook opens this feature up to brands, it will act as an extension to their customer acquisition activities for any brand, from consumer to B2B. It will be interesting to see how Facebook users respond to these new marketing opportunities—whether they will interpret articles from brands as marketing or as an improved experience. And for marketers, especially content marketers, as the digital landscape continues to change, the best advice is: Stay tuned and get ready! It seems that the downside to publishing on Instant Articles is almost negligible when contrasted against the benefits. What do you think about Instant Articles? If it opens up for brands, will you be on board?